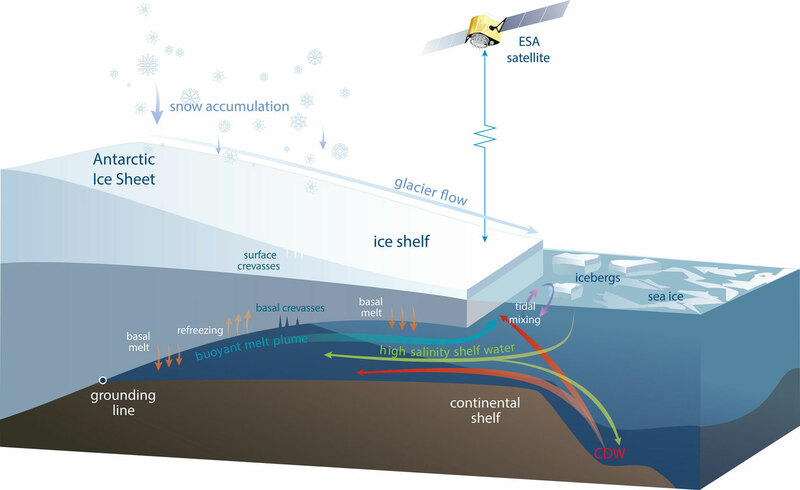 Schematic diagram of an Antarctic ice shelf showing the processes causing the volume changes measured by satellites. Ice is added to the ice shelf by glaciers flowing off the continent and by snowfall that compresses to form ice. Ice is lost when icebergs break off the ice front, and by melting in some regions as warm water flows into the ocean cavity under the ice shelf. Under some ice shelves, cold and fresh meltwater rises to a point where it refreezes onto the ice shelf. Image courtesy of Helen Amanda Fricker, Scripps Institution of Oceanography, UC San Diego. A recently published study led by researchers at Scripps Institution of Oceanography at UC San Diego that shows a significant decline in the thickness of Antarctica’s floating ice shelves was assisted by high-performance computing resources at the university’s San Diego Supercomputer Center (SDSC). The widely reported study, published March 26 in the journal Science, used SDSC’s TCC (Triton Compute Cluster) and TSCC (Triton Shared Computing Cluster) to analyze 18 years of satellite data. Before further processing the data, the researchers had to first calculate the points where samples from two satellite orbits crossed each other. This is a very time-consuming task because there are thousands of orbits and millions of potential crossing points, explained Paolo. Paolo assisted Scripps glaciologist Helen Amanda Fricker and oceanographer Laurie Padman of Earth and Space Research, a non-profit institute in Corvallis, Oregon, in constructing a new high-resolution record of ice shelf thickness based on satellite radar altimetry missions of the European Space Agency from 1994 to 2012. The study reports that the ice shelves decreased in volume by as much as 18 percent in certain areas over almost two decades, providing new insights on how the Antarctic ice sheet is responding to climate change. Merging data from three overlapping missions, the researchers identified changes in ice thickness that took place during more than a decade, an advancement over studying data from single missions that only provide snapshots of trends. A Scripps video showing the ice melt due to rising temperatures can be viewed below. While melting ice shelves do not contribute directly to sea-level rise, the researchers indicate that there is an important indirect effect. Under current rates of thinning, the researchers estimate the ice shelves restraining the unstable sector of West Antarctica could lose half their volume within the next 200 years. “The ice shelves buttress the flow from grounded ice into the ocean, and that flow impacts sea-level rise, so that’s a key concern from our new study,” said Fricker, who added that future studies will concentrate on the causes behind changes in ice shelf volume, including the effects of the atmosphere and ocean. SDSC launched the Triton Shared Computing Cluster (TSCC) in 2013 to provide UC San Diego investigators with a high-performance computing (HPC) system dedicated to their needs with quick access and reasonably short wait times. Following an extensive study of successful research computing programs nationwide, SDSC chose a “condo computing” model as the main option for TSCC users. Condo computing is a shared ownership model in which researchers use equipment purchase funds from grants or other sources to purchase and contribute compute “nodes” (servers) to the system. The result is a researcher-owned computing resource of medium to large proportions. In 2014, some 14 UC San Diego labs/groups and 230 users participated in the program for a total of 170 nodes (approximately 3,000 processors) and more than 80 teraflops of computing power. Participating researchers/labs are working in a variety of disciplines including engineering, computational chemistry, genomics, oceanography, and high-energy physics. For more information please visit TSCC Computing. As an Organized Research Unit of UC San Diego, SDSC is considered a leader in data-intensive computing and cyberinfrastructure, providing resources, services, and expertise to the national research community, including industry and academia. Cyberinfrastructure refers to an accessible, integrated network of computer-based resources and expertise, focused on accelerating scientific inquiry and discovery. SDSC supports hundreds of multidisciplinary programs spanning a wide variety of domains, from earth sciences and biology to astrophysics, bioinformatics, and health IT. In 2015 SDSC will debut Comet, a new petascale supercomputer that will join its data-intensive Gordon cluster. SDSC is a partner in XSEDE (eXtreme Science and Engineering Discovery Environment), the most advanced collection of integrated digital resources and services in the world.